If you’re looking to travel within Myanmar, you generally have three options: flying, taking the bus, or taking the train. All of these have questionable safety records. Train tickets actually include life insurance because the trains derail so often. Buses have hair-raising names such as “Hot Rod Grand Prix” with sometimes questionable braking systems. Flying, while usually safe, isn’t much better in Myanmar. Myanma, the national airline of Myanmar (and formerly known as Burma Airways) had, until recently, one of the poorest safety records of any airline. If you’re from the US, you aren’t allowed by the Department of the Treasury to fly Yangon Airways because it’s owned by drug traffickers. The same goes for Air Bagan. 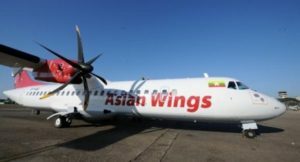 Only one airline is sort of normal in Myanmar; Asian Wings Airways which is 49% owned by ANA of Japan (and their flights almost always sell out). If you ignore the safety issue (after all, flying is still relatively safe compared to other options) it’s still really expensive to fly. Most flights within Myanmar cost over $100, and are rarely more than one hour. Making matters worse, the only airline that regularly shows up on some (but not all) online booking sites is the airline with the worst safety record and most checkered past: Myanma Airways. “Don’t do it!” said the owner of my guest house, shaking her head and tut-tutting like a mother hen. “Too dangerous!” Locals know best and I took her advice. Fortunately, there are two other airlines with a nationwide network that offer online booking: Asian Wings Airways and Air KBZ. If you want to fly with Asian Wings Airways, you need to book in advance. They’re the only airline in Myanmar with an (as of yet–note they’ve only been in business since 2011) unblemished safety record. ANA provides training for their pilots and crew and technical assistance, and they are generally considered the most professional airline operating in the country. Their flights sell out consistently. Want to fly on this plane? Book early! The next-best option is Air KBZ. They’re owned by one of the largest banks in the country (KBZ Bank) and are relatively well capitalized. It may seem odd that a bank owns an airline, but a different bank in Yangon owns one of the larger bus lines in the country. Transportation just seems to be something that banks do here (maybe Chase and American Express will copy them given their affinity for travel rewards cards). One of the nice things with Air KBZ (apart from only one non-fatal safety incident) is that they offer discount fares if you book with them directly online. What’s more, their Web site actually works for payments with American credit cards! Given that sanctions against Myanmar were only lifted recently, a lot of Web sites haven’t been updated to reflect this. Being able to pay online with a US credit card–much less getting a discount for it–is a massive convenience in Myanmar. Most airlines in the country can be booked only through local travel agents, and fares are quoted and paid in USD. Unfortunately, businesses will only take absolutely pristine, crisp, new USD notes. In cash. Preferably in high denominations. Credit cards aren’t widely accepted in Myanmar, so paying with USD either means you brought it with you (in new, uncirculated bills) or you’re withdrawing kyat and changing it to dollars (taking a double hit on the exchange rate plus an ATM fee). When I factored in the currency exchange shenanigans on a $114 fare, the $5 ATM fee, and the savings for booking online, I saved $30 by booking a $101 online-only fare with Air KBZ. And a whole lot of hassle! What’s more, given the size of the aircraft, I’m safe: I won’t be flying in Seat 31B!